The knowledge that an unseen energy flows through all living things and is connected directly to the quality of health has been a part of the wisdom of many cultures since ancient times. The word Reiki can be interpreted as Rei “Universal” Ki “Divine Energy” As used in the word Reiki, it more accurately interprets as meaning Spiritual Consciousness and is the vital force that flows through all living things. Reiki is a simple yet powerful technique to administer and learn. Reiki is not taught in the usual sense but is transferred to the student by a Reiki master. Its use is not dependant on ones intellectual capacity or Spiritual development and therefore available to everyone. It has been successfully taught to millions of people around the world of all ages and backgrounds. Some people may think they need to be unwell or have ‘something wrong’ that needs fixing before having Reiki. This may be the case but not necessarily, as Reiki healing is a great way to maintain our bodies’ natural harmony. Traditionally an oriental healing technique, more and more westerners are recognising and embracing the undeniable benefits of Reiki. A natural form of healing, it is non-invasive, painless and suitable for anyone. 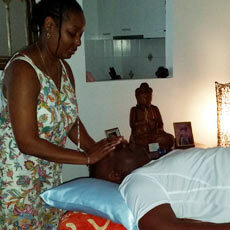 People often comment how comforting they find the experience of Reiki to be. An interesting study reported that recipients frequently feel that they are hovering in a threshold state of consciousness, simultaneously aware of their surroundings and deeply drawn internally. Some people fall into a deep, sleep like meditative state. The most common experience is an almost immediate release of stress and a feeling of deep relaxation. My journey with Reiki began in 1995 after experiencing the laying on of hands and instantly knowing that this was something I wanted to experience more of. It was then that I realised, there was more to this life than the form we see. It was the unseen energy that flowed in and through me giving me a brief experience of being in tune with the Life Force energy of the universe. My life changed for the better, the healing was fulfilling as my mind, body and spirit began to merge into a whole being. So many moments of healing and deeper connections with Spirit kept me on track, and deepening my life experiences for the better. Now as a Reiki Master I am truly blessed to be able to share this gift to those who want to learn, and to incorporate this natural calming modality within my Therapy work, to allow a deeper change and transformation to occur within the clients being.